As the snow stops falling up in the mountains we start to get excited about hiking. 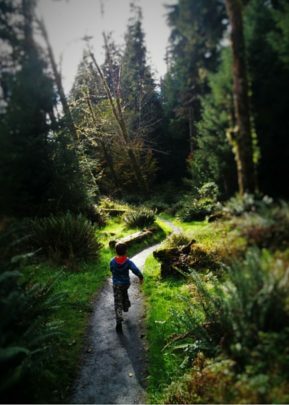 There are so many easy, kid friendly hikes in Washington, so actually picking where to go first is the biggest struggle. 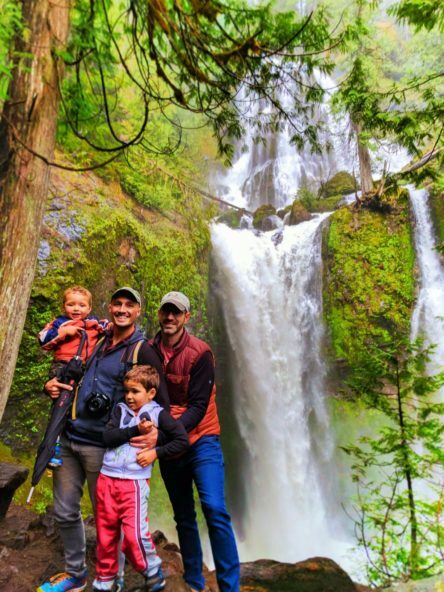 We’ve checked in with some of our favorite Pacific Northwest families and bloggers for their favorite springtime hikes and I love our collective plan! 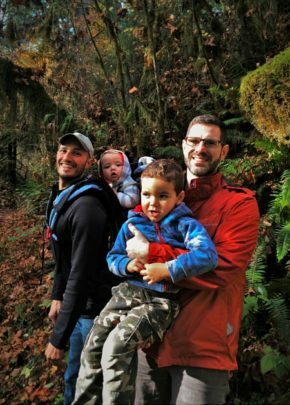 And don’t forget, most kid friendly hikes in Washington are also great for adults of varying hiking skill level. I mean, who doesn’t appreciate an incredible waterfall? Who doesn’t love feeling tiny walking among giants? 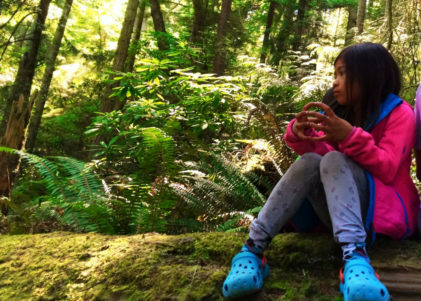 Whether kids are hiking on their own or if you’ve got them in a hiking pack of some sort, the same rules apply. Prepare yourself mentally and with supplies and you’ll be good to go. 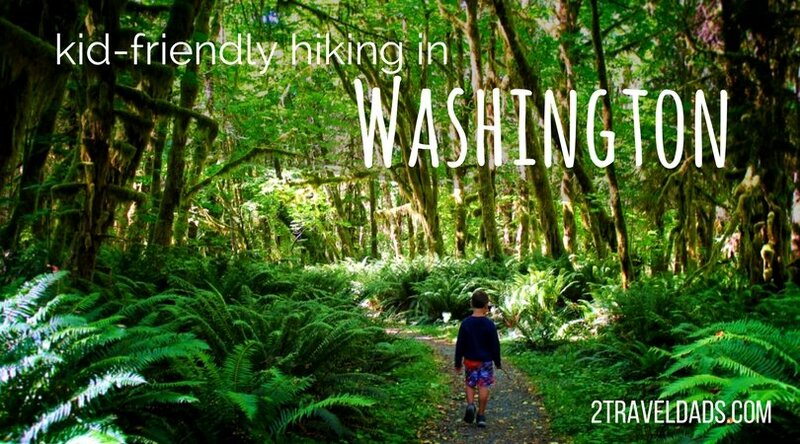 We frequent a ton of kid friendly hikes in Washington, but the ones we’re sharing here are the prettiest, most interesting ones. 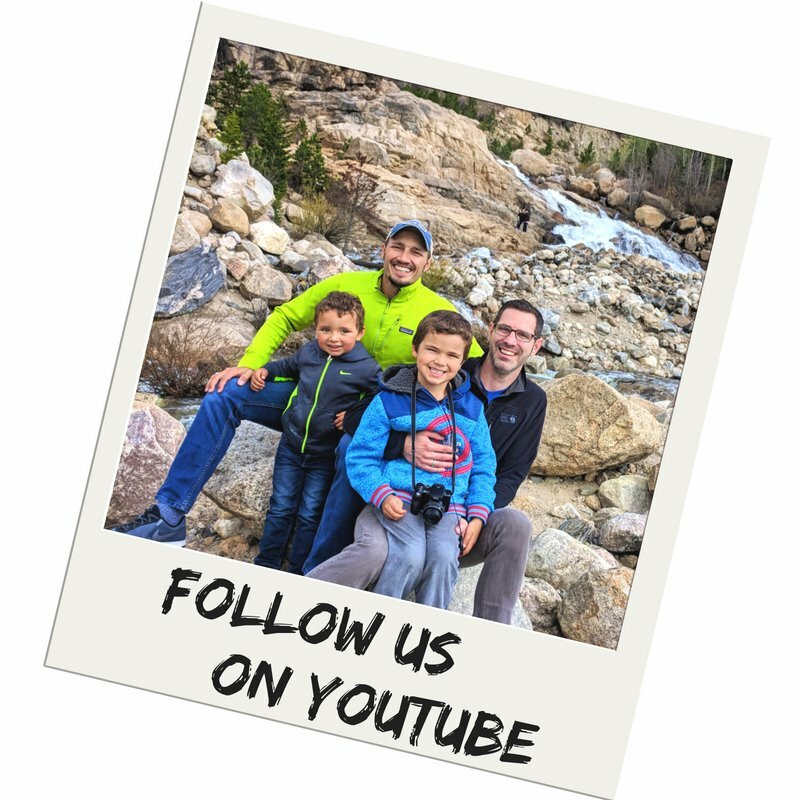 There are hundreds of hikes we’ve not tried yet, so if there’s one you think we need to share, be sure to leave a comment at the end or send us a note to tell us about it. Why save the best for last? Murhut Falls on the western side of Hood Canal is awesome! 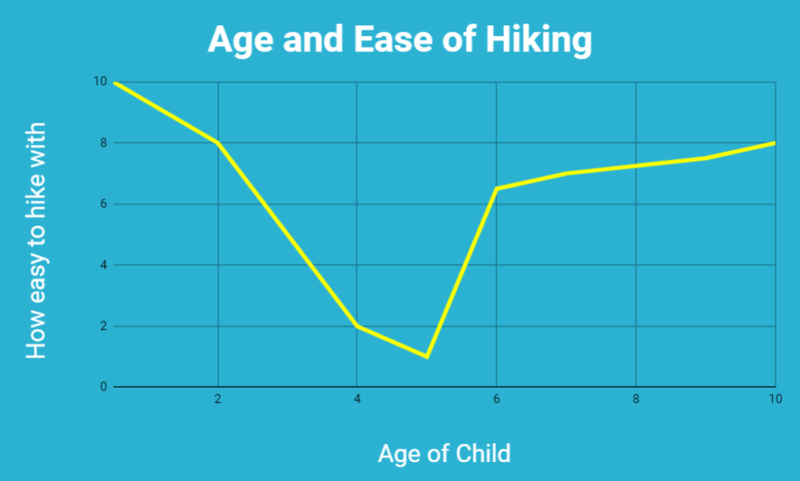 The elevation gain isn’t too difficult for kids but will provide a workout for adults carrying kids in a hiking pack. Along the trail you’ll cross a few small creeks, see some really cool views through the trees (hiking on a slope) and the payoff at the end is amazing. Murhut Creek is a double plunging waterfall with two very different levels. The upper falls goes in front of a shallow cave and the moss is epic. The lower falls makes a gorgeous deep blue pool that is too beautiful to stay out of. Note: the upper falls is visible from the lookout at the end of the trail, but to get to either the upper or lower plunge pools you do have to scale a wall using roots and limbs as ladders. Kid friendly rating: 7 – not a 10 because of how you access the base of the falls, which isn’t safe for young kids. Bonus: huckleberries! 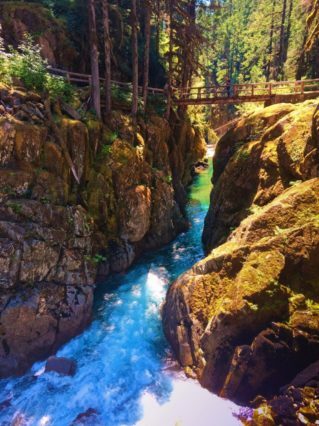 Located off Highway 101 just after Lake Crescent, the Storm King Ranger Station of Olympic National Park is the starting point to hike to Marymere Falls. 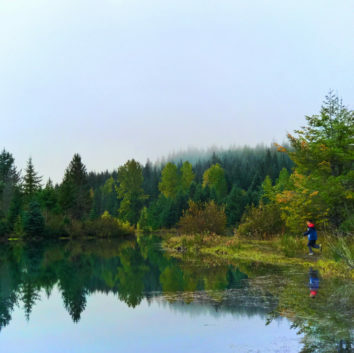 This hike makes our list of kid friendly hike in Washington because the elevation gain is minimal and the trail is wide. 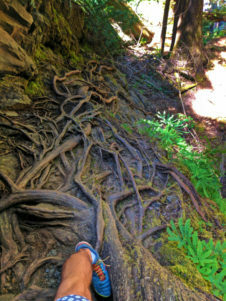 Hiking through an old growth forest in Olympic National Park, there are tons of cool trees and creeks to enjoy. There is even a large area before getting to Marymere Falls where you can get in the creek and freeze your toes off. Access to Marymere Falls is across a few small bridges and then up a steep trail. The trail is very short, so the steepness doesn’t matter too much. There are two options for viewing the falls and you’ll want to take the upper loop. It may look more difficult, but it’s not actually. Note: if you play in the creek, check the area for salmon reds (areas of fertilized eggs). DO NOT DISTRUB the nest areas. 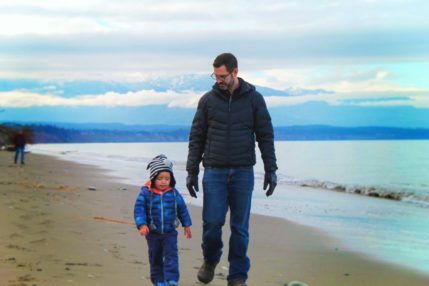 Outside of the town of Sequim is the Dungeness National Wildlife Refuge. It’s a beautiful preserve with meadows, coastal forests, and miles of beaches. The hike that really is the “wow” goes eastward along the beach towards the Dungeness Spit Lighthouse. Beach hiking is tiring but you can do just a bit of it and then just relax or play if you’re not up for the whole 7 miles out to the lighthouse. This is actually a great opportunity for seeing wildlife. 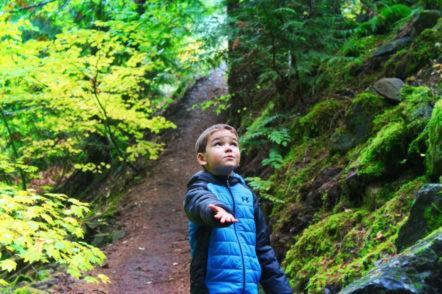 From whales to eagles, there is a ton of wildlife to spot on this hike, which is what makes it one of the best kid friendly hikes in Washington. 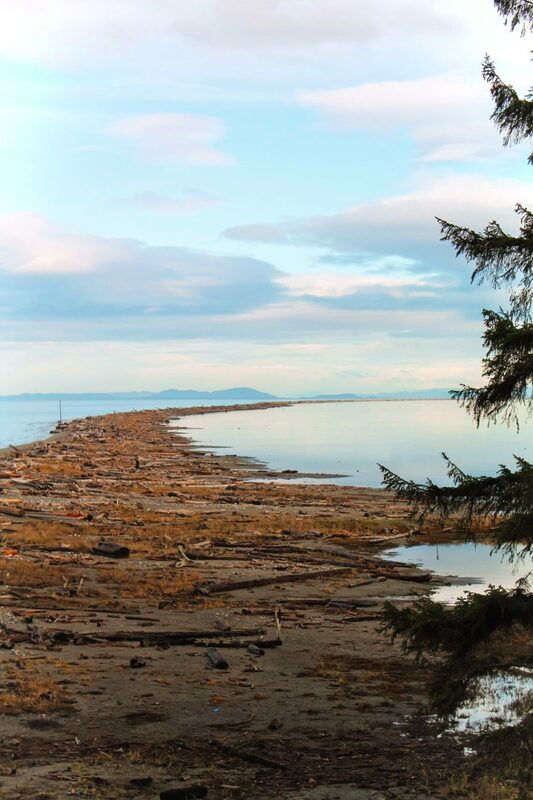 Tip: if you’re planning on hiking all of the way to the Dungeness Spit Lighthouse, be sure to pack lot’s of water as there’s none between the trail head and the lighthouse. Also, check the tide tables to be sure that you’ll not be facing a king tide or crazy high tide on your hike. 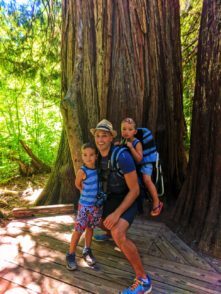 Kid friendly rating: 8 – it’s not a 10 because the full hike isn’t doable with young kids, but a good portion is good for any age. Distance: 1 mile round trip OR as far as you like. Hiking to the lighthouse is 11 miles round trip. 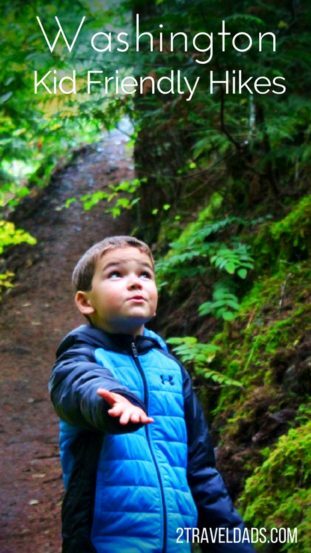 Both the Hall of Mosses make our list for the best kid friendly hikes in Washington because they are very similar and crazy beautiful. 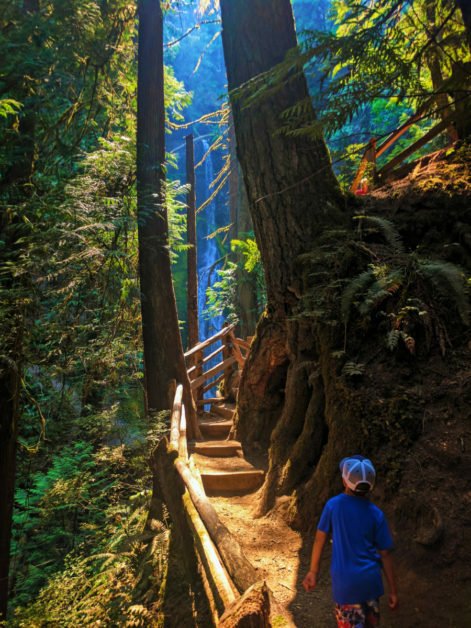 For adults these hikes are great because the deep greens and extreme quiet of the old growth forest are unlike anything in the state. 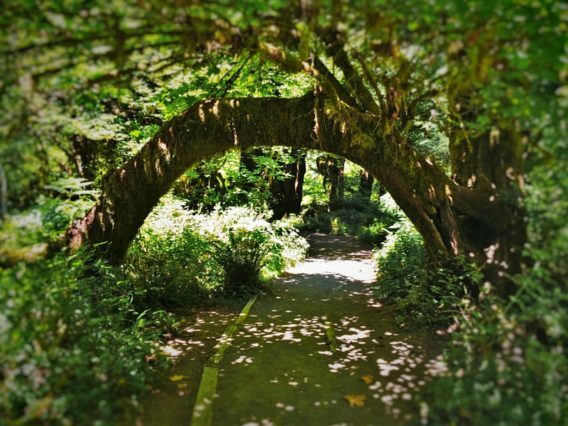 For kids, hiking Hall of Mosses offers a chance to feel like you’re in a magical cartoon world full of gnome houses and mysterious shapes. It’s just too cool. 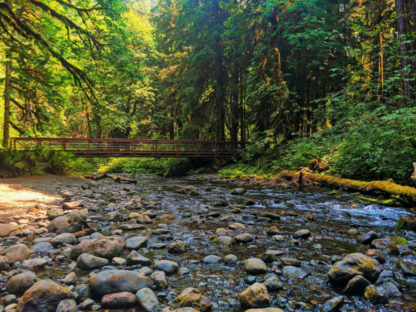 Note: the Hoh and Quinault Rainforests are more than an hour’s drive apart from each other and are different enough that if you wanted to do both, everybody would still be interested and it would be worth making time to do them. 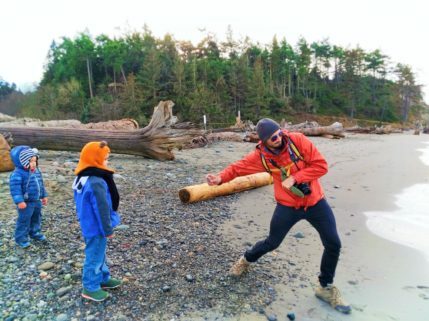 If you’re driving all the way to the coast, a good idea is to stay at the Kalaloch Lodge right between the two… and the beach at Kalaloch is awesome. 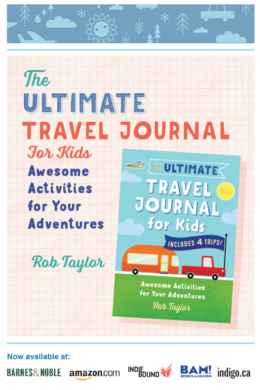 Kid friendly rating: 10 – these hikes both score at the top for their universal appeal, unique features and ease. They’re great any time of year and are mostly flat. Distance: Quinault is less than a mile and very flat. 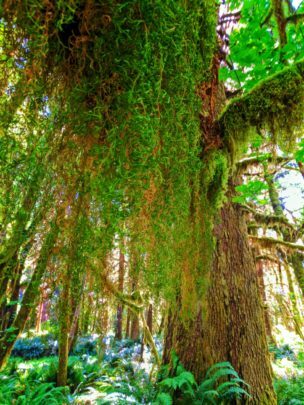 The Hoh’s Spruce Trail is 1.2 miles and the Hall of Mosses is less than a mile round trip. 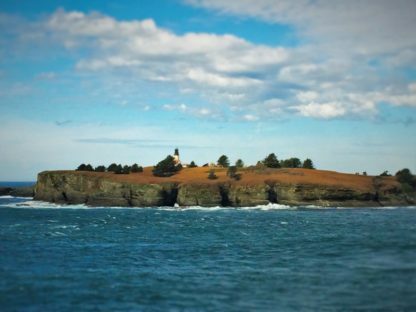 Also on the Olympic Peninsula (can you tell it’s our own personal playground), Cape Flattery is very unusual and deserves to be the setting of some epic fantasy film. 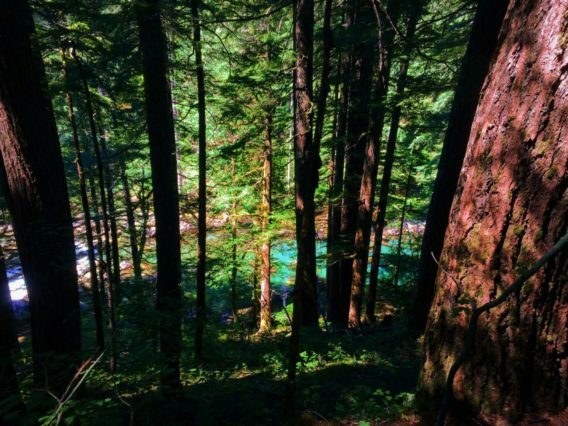 The waters are the most incredible turquoise and the forests are just the right amount of mystically creepy. 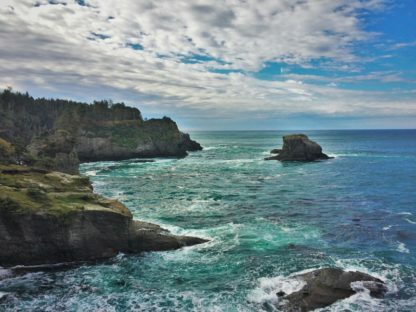 Being at the absolute tip of the Continental US, the views from Cape Flattery are astounding. 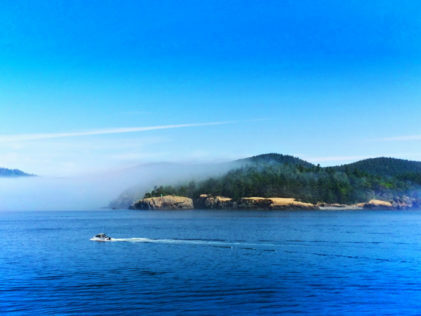 The Pacific Ocean meets the Strait of Juan de Fuca right here and the swirling water paired with the cliffs is just all too picturesque. The hike isn’t too long for a big payoff, including a lighthouse out at sea. Note: much of the trail is on boardwalks, which is both good and bad. Easier on the ankles, but also easier to get distracted because it’s easier and then fall because you’re not watching your steps. 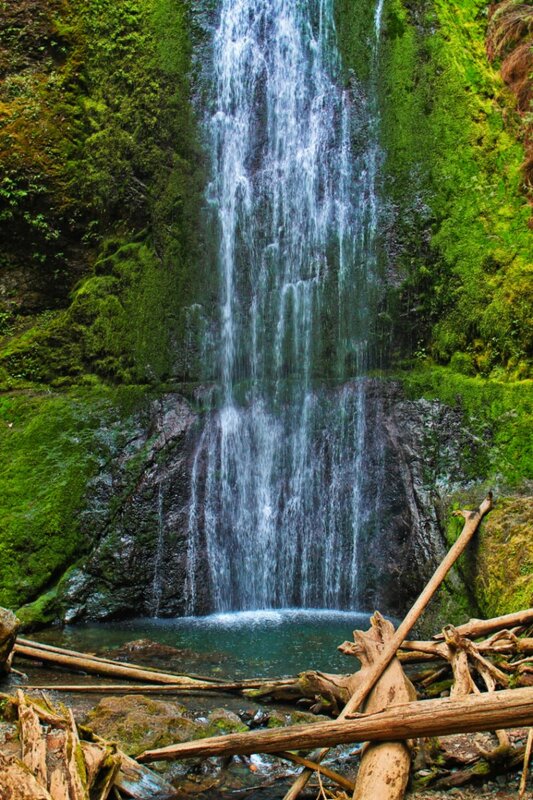 Now we’re talking about hiking down in the Columbia River Gorge. 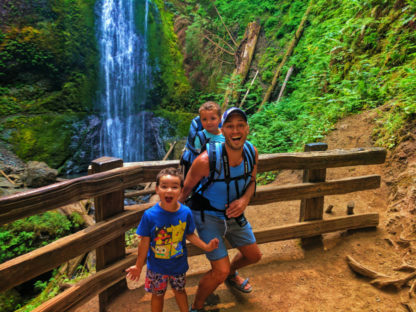 Most people think of Multnomah Falls and the waterfall area on the Oregon side of the river, but some of the most kid friendly hikes in Washington are found down here. 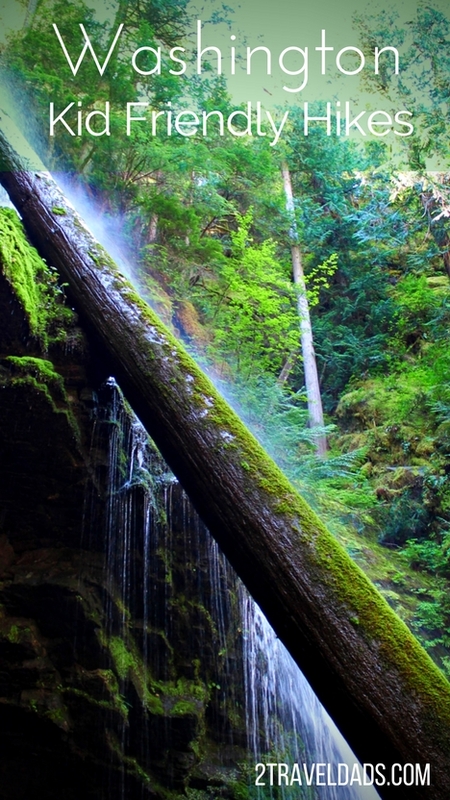 Falls Creek Falls takes you through Gifford Pinchot National Forest deep into the woods. 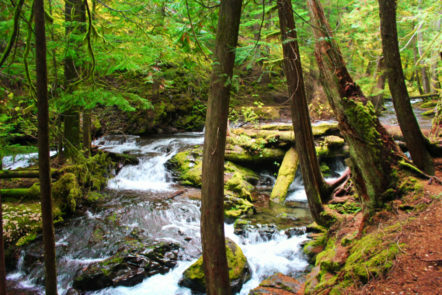 Most of the hike is through dense forest, but there are lots of creeks to give it a chill vibe. Also, a sturdy suspension bridge over a gorge adds something fun for kids to enjoy. At the end of the Falls Creek Falls trail is a wonderfully grand waterfall. Cascading down several levels and splitting into several falls with intense flow, Falls Creek Falls is very unique and overwhelming. 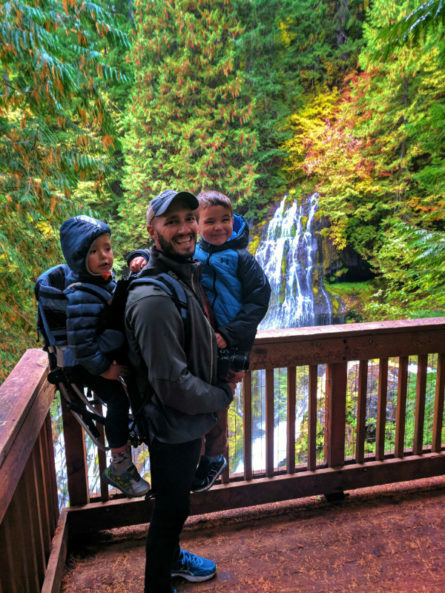 Note: the viewing area at the end of the trail is plenty safe with big kids, but you’ll want to keep smaller kids close if they’re a bit wild, just because if they decide to get adventurous you are at the top of a cliff across from a plunging falls. 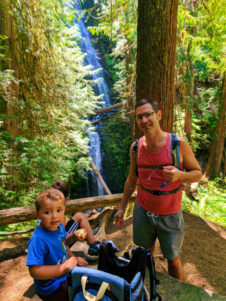 Kid friendly rating: 7 – Falls Creek Falls gets a lower rating simply because it’s a muddy trail at times and the end of the trail requires a good deal of supervision with kids. WEAR CLOTHES TO GET DIRTY. 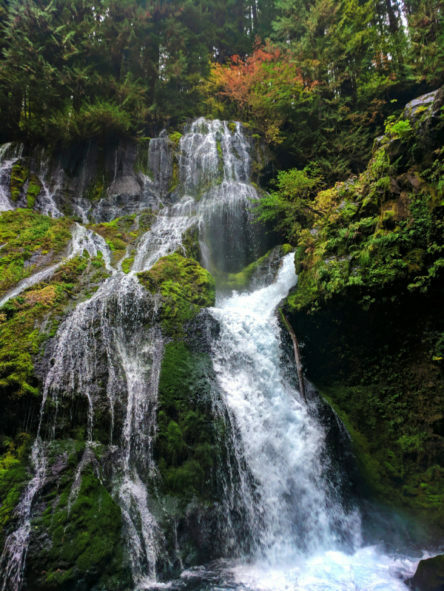 Just east of Stevenson, Washington and the Skamania Lodge is Panther Creek Falls. It’s a drive up into the hills but it’s worth it. 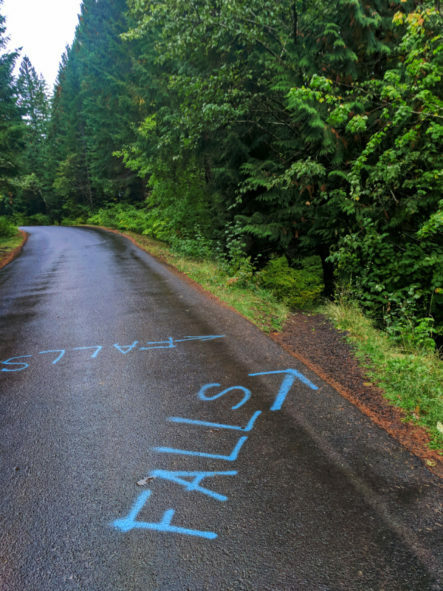 Actually, the road to Panther Creek Falls will also take you around Mt Adams and through the Gifford Pinchot National Forest. 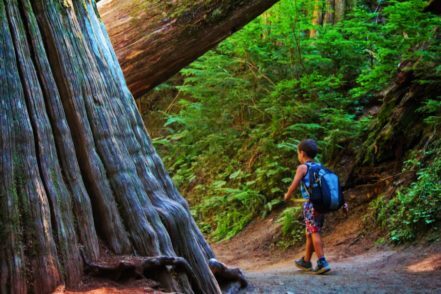 When you stop here, you’ll immediately see why this is one of the most kid friendly hikes in Washington. You will park in the pull off from Forest Road 65 and then walk on the road to the south (aka the direct the creek flows). You’ll see a trail going just off the road maybe 50 feet from where you parked. This guides you down to the viewing platform. 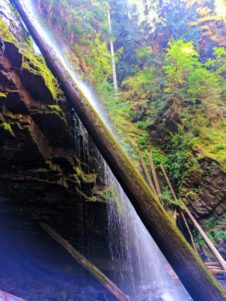 It’ll only take a few minutes to get to the Panther Creek Falls overlook. Okay, this isn’t a hike: it’s a mild jaunt. Note: if you want to see the continuation of the falls or check it out from below, you’ll easily find the other trail near the platform. There are several ropes in place to help scale the walls to the splash zone. Kid friendly rating: 9 – the only reason it’s not a 10 is because it’s such a short visit. 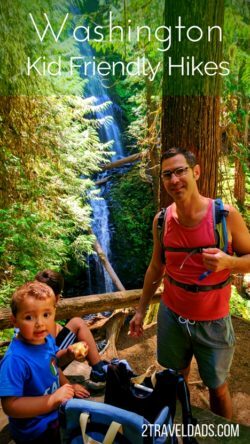 The hike is super short and very kid friendly, but there’s not much else at this specific stop (so pair it with another activity). 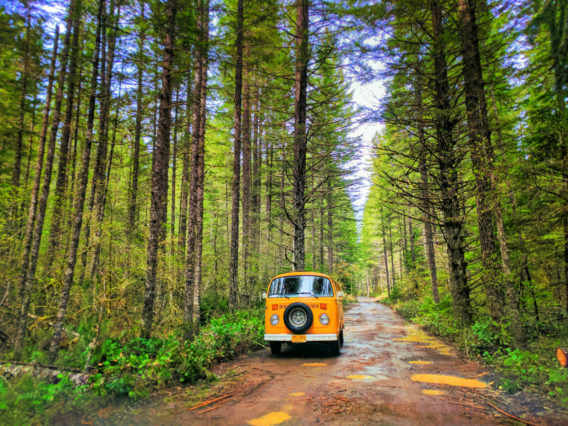 Visiting Mount Rainier National Park is such a fun experience, whether for camping or just a day trip. We’ve started planning our trips around Washington state to include short stops at Mount Rainier. 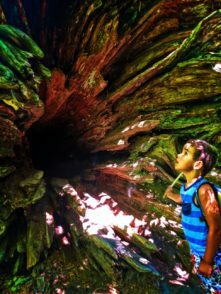 The Stevens Canyon / Ohanapeckosh area of the park is actually loaded with kid friendly hikes, but two stand out as being the most interesting for kids: the Grove of the Patriarchs and Silver Falls. 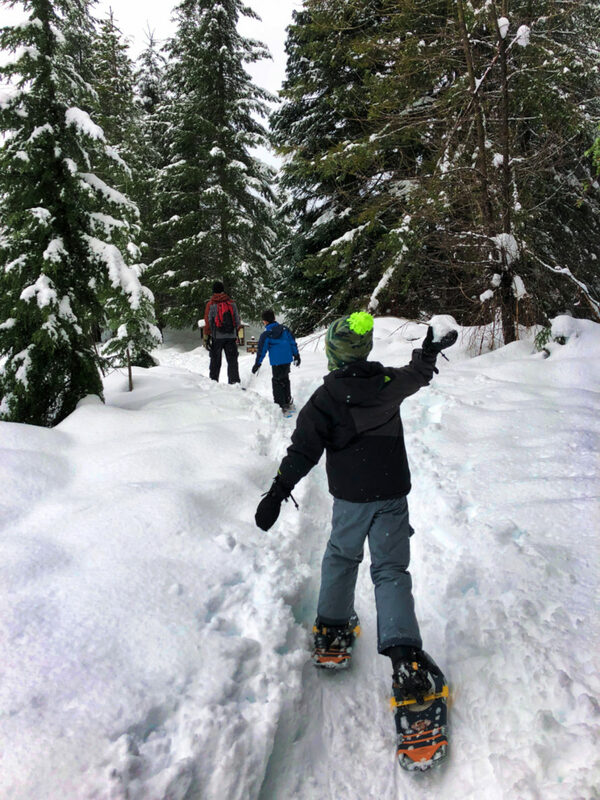 These are two of the most kid friendly hikes in Washington, for sure and they’re easy to do on the same day or different trips through Mount Rainier National Park. 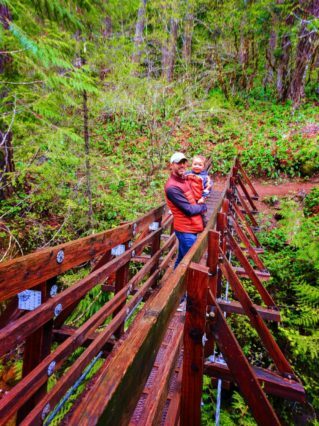 Kid friendly rating: 10 – this trail is safe from start to finish, the Ohanapeckosh River is so colorful, the trees are absolutely epic, there’s a suspension bridge… There are many reasons it’s perfect for anybody. Also, much of the trail through the Grove of the Patriarchs is on a boardwalk which makes it a smooth hike. 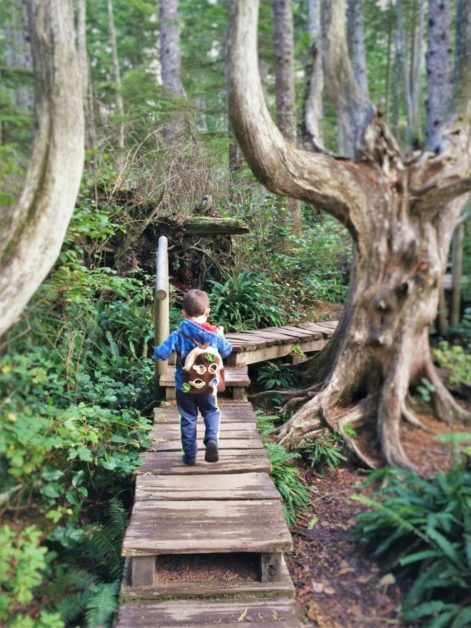 Kid friendly rating: 10 – we love everything about this kid friendly hike. 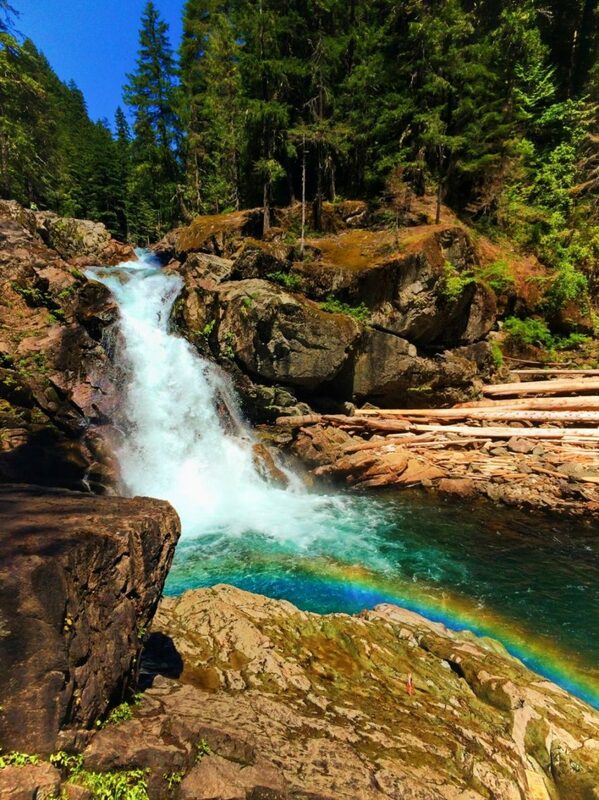 There is a thermal feature, mossy forest, a narrow bridge across a gorge, a perpetual rainbow at Silver Falls itself. It’s also a perfect hike. 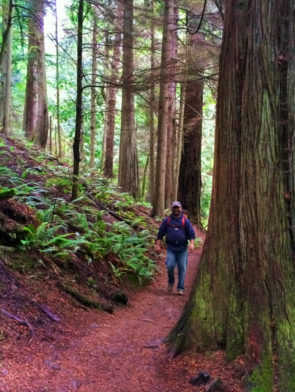 Stretching along a coastal portion of Deception Pass State Park, the North Beach Trail is a relatively easy hike through lush old-growth forest, with scenic views that lead to a beach. 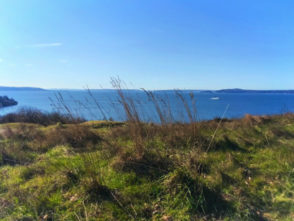 One end of the trail begins at the park’s West Point, and continues east along a ridge where you can take in views of Deception Pass, the strait that separates Washington’s Fidalgo Island with Whidbey Island. After ending at Gun Point, return back to West Point along the beach, for a more leisurely and scenic stroll. 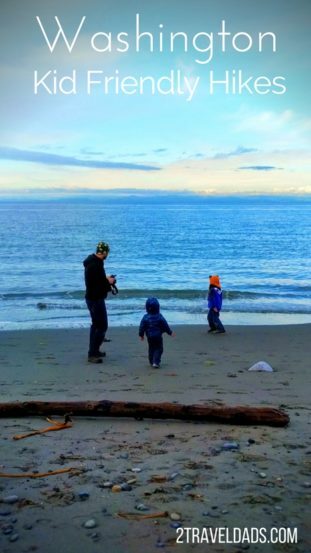 The elevation gain of only 100 feet makes it a perfect introductory hike for toddlers and young kids. 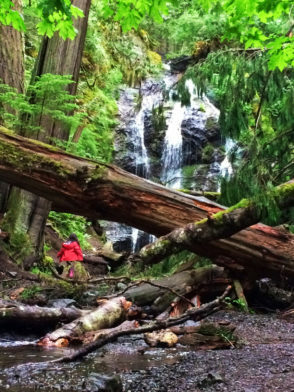 Located in Orcas Island’s Moran State Park, the Cascade Falls Trail is a great introductory hike that offers kids a slight challenge with a stunning payoff. 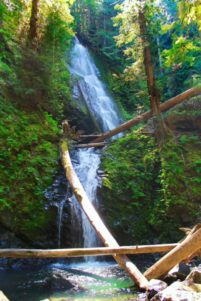 A short half mile round-trip hike, the Cascade Falls Trail begins at the Mount Constitution entrance and winds through old-growth forest, eventually leading you to Cascade Falls, Orcas Island’s highest waterfall, standing tall at 40 feet. The trail path is relatively wide, but the steep descent to the base of the falls can be slightly challenging for youngsters. However, the beauty of the falls is worth the challenge. 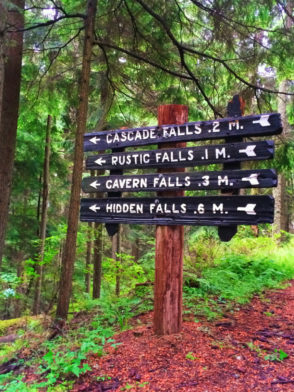 For those wanting a much longer hike, start at the trail head at the South End Campground and continue along Cascade Creek to Mountain Lake, with a stop at Cascade Falls midway through the hike. 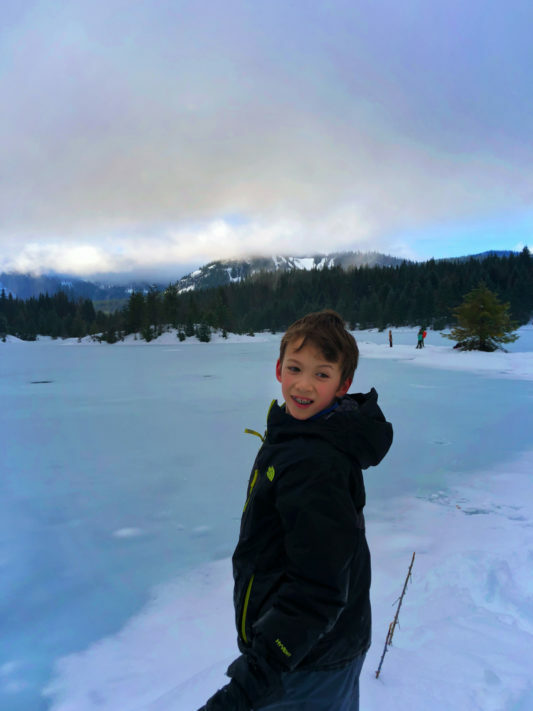 When people ask me for a family-friendly hike that’s good for all ages that is not too far from Seattle but still far enough to feel like you’re in the wildness a bit, the best one I can think of is always Gold Creek Pond in Snoqualmie Pass. 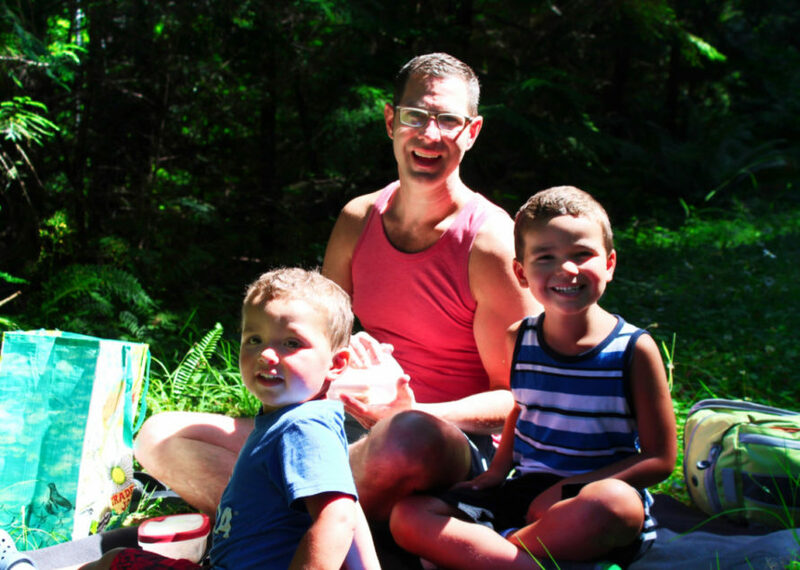 It’s about an hour’s drive from Seattle for a 30-ish minute, 1 mile jaunt around a sparkly man-made lake that can take a whole afternoon if you leave time for rock tossing and a picnic. The path is paved so it’s a great place to take a baby carrier for an inaugural hike and bring a stroller along for backup. 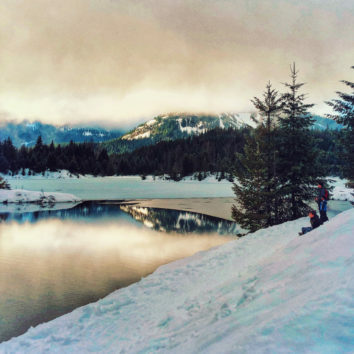 Tip: in the winter this is an awesome place for families to snowshoe too and it’s actually one of the designated Snow Play areas up in Snoqualmie Pass. Kid-friendly rating: 10 for little kids, 7 for big kids because it’s so simple and because you know, big kids. Discovery Park is located in the Magnolia neighborhood of Seattle. 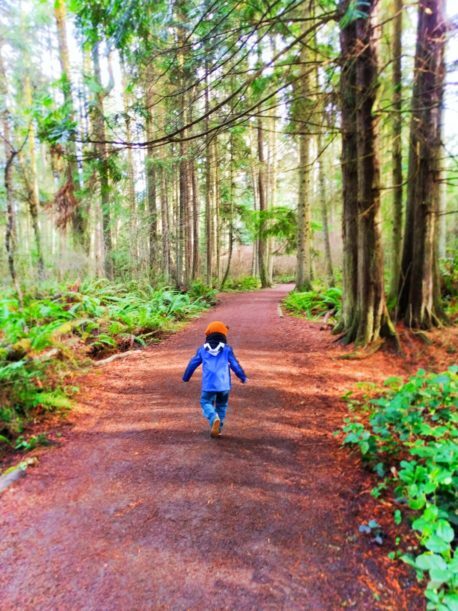 This park is the largest in Seattle boasting 534 acres of the former U.S. Army Fort Lawton. 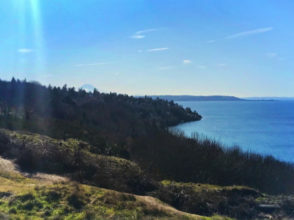 The park has over eleven miles of trails and includes forests, prairies, and beaches with spectacular views of the Olympics, Puget Sound, Seattle and Mt. Rainier. 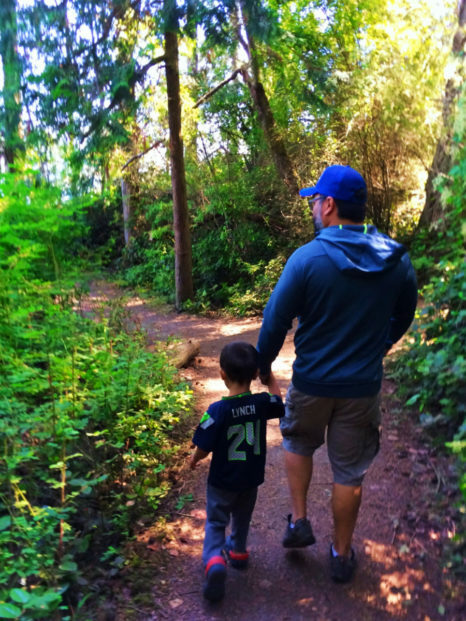 It’s full of kid friendly hikes and right in the middle of Seattle! When we visit we usually park in the North Parking Lot. From here you can access several of the trails including the Discovery Loop trail or the Hidden Valley Trail. 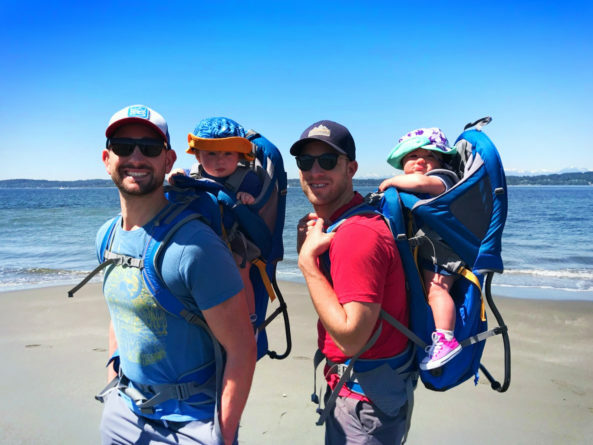 We love hiking all the way out to the beach to take in the views from the West Point Lighthouse at the tip of the Park as well as hoping to catch some glimpses of all of the Puget Sound marine life. Discovery Park is also home to the United Indians of All Tribes Daybreak Star Cultural Center, many of the original Fort Lawton buildings including officer housing and parade grounds as well as more blackberries than anyone can possibly pick in late July through the end of August. Do you see how with all of the travel we do we’re still always excited to come home? 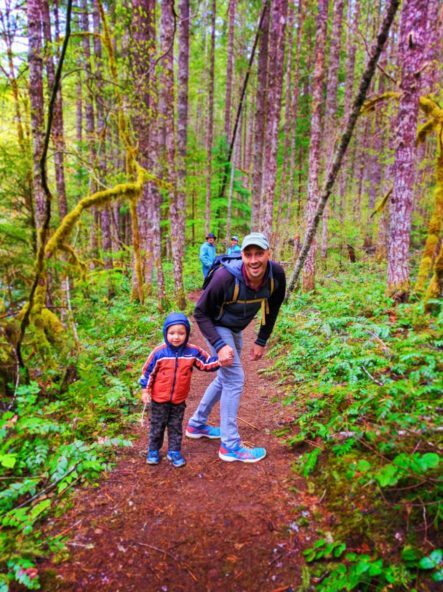 There are so many kid friendly hikes in Washington State that we’re never bored. As the kids grow up, I’m sure we’ll find even more and we’ll be sure to share. 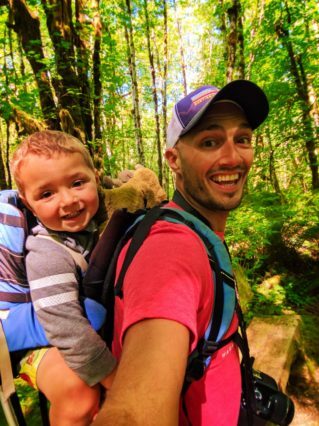 Are there any favorite, kid friendly hikes that you think we need to include? We’ll be sharing more of our favorite hikes as the summer approaches, so tell us now if you’ve got a recommendation so we can go hike it! 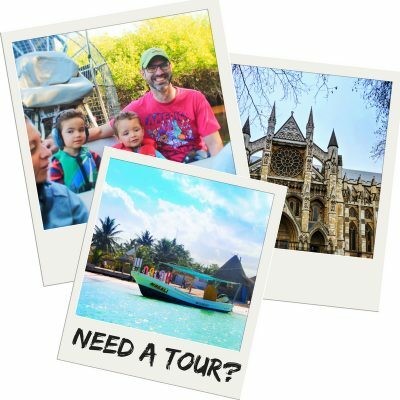 And feel free to pin this for your own travel planning to Washington State, or if you’re in need of some great day trip options around Western Washington.